After four and half years of Sar e Aam, we invite all Pakistanis to come under our umbrella to voice their opinion. We will continue to invite everyone to join us to make our country shine on world map. So stay tuned for sensation to hit the headlines. Let’s wake up to make a better Pakistan for our generations to live peacefully. Come join us in this noble mission and enlist yourself as a member of Sar e Aam family. Iqrar ul Hasan invites you to be a apart of Sar e Aam family and join his team to make Pakistan shine. Small, good deeds aiming to change society for betterment can be achieved with collective efforts. So, come and join this mission for a better Pakistan. 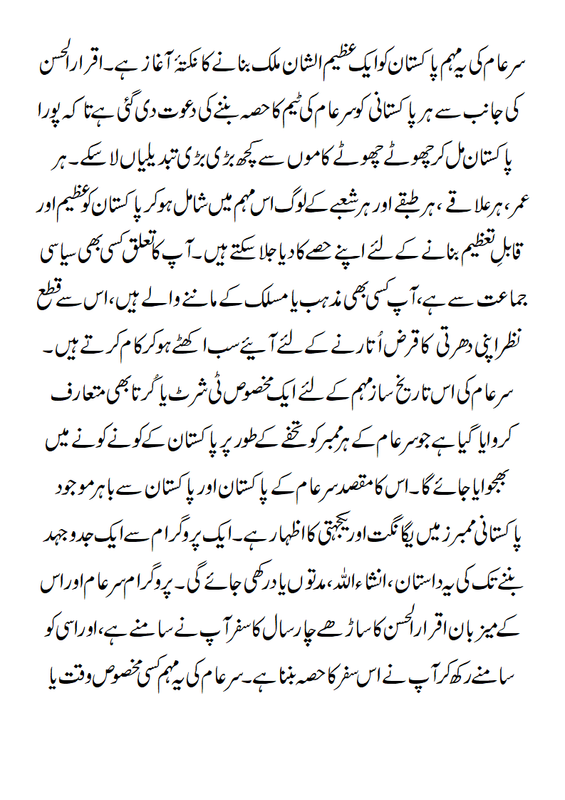 We call upon the overseas Pakistanis to come and join hands with us. We are one nation even if seven seas apart!!! Be a member of Sar e Aam team and get your T shirts. Every citizen of Pakistan is our Brand Ambassador to carry our message and aim to change their domain for betterment. Our collective effort under the Umbrella of Sar e Aam invites all those who think above age, race and creed. We need to free our minds from social taboos and lead on to the path of change!!! We will lay foundation for a better Pakistan by capitalizing on the members of Sar e Aam family skills to make the dream come true of a prosperous country …. In Sare-e-Aam, our host Iqrar-ul-Hassan takes problems and injustices faced by a common man and place them before the caretakers of the society hence creating a platform for the unheard to voice their concerns.